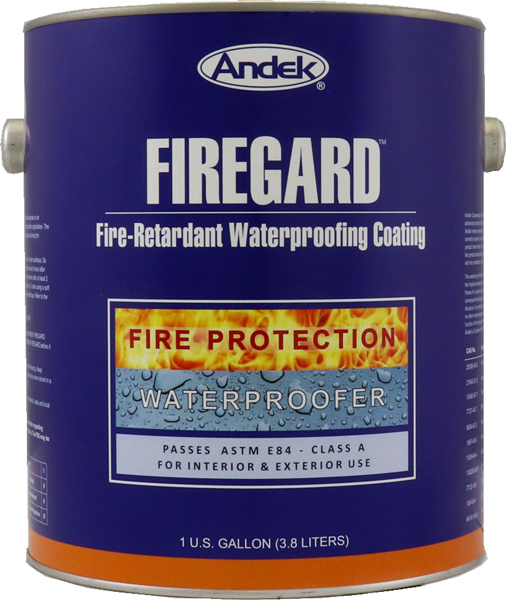 Andek Firegard is a durable, waterproof, fire-retardant coating that forms both an ignition barrier and a thermal barrier. When exposed to fire, Andek Firegard expands to many times its original thickness. This generates a thermal insulating layer that protects the substrate from auto-ignition. In addition to its exceptional fire retardant properties Firegard is an extremely durable coating that waterproofs the coated surface. It withstands exposure to harsh outdoor weather and may be repeatedly washed without damage. Durable, waterproof, fire-retardant intumescent coating. Waterproof coating can be repeatedly washed and withstands weather in all climates. For interior and exterior use. Forms a vapor barrier. Proven fire protection over a wide range of surfaces. Brings existing and new structures into compliance with building and fire codes. Contains fungicide to protect surface from microbiological activity. Low odor during application and negligible bounce-back from overspray. May be used on vertical, pitched and horizontal surfaces. Available in a wide range of standard and custom colors. Can be used over wood, wood composites, cellulosics, insulation materials, polyurethane foam, concrete, stucco, mineral composites, EIFS, bricks/masonry and other surfaces both on the interior and exterior of buildings. Normal application for most surfaces will require 1 gallon per 100 square feet (16 wet mils = 10 dry mils). Where additional protection is necessary, two coats at 120 square feet per gallon per coat will provide an overall coverage of 60 square feet per gallon (27 wet mils = 17 dry mils). All surfaces to be coated must be clean, dry and free of loose particles, oils, grease or any substance that would interfere with proper bond. A careful inspection of the surface should be made to detect any signs of damage or defects, and all repairs should be completed before application begins. Most non-porous, non-metallic surfaces will not need to be primed. Metals should be primed with Polaprime 21. Porous surfaces should be primed with Polaprime 2. Once preparation is completed and any primers are thoroughly dry, ANDEK FIREGARD may be applied. ANDEK FIREGARD may be applied using brush, roller or airless spray technique. Normal application for most surfaces will require 1 gallon per 100 square feet (16 wet mils = 10 dry mils). Where additional protection is necessary, two coats at 120 square feet per gallon per coat will provide an overall coverage of 60 square feet per gallon (27 wet mils = 17 dry mils). Tools may be cleaned using water while the product is still wet. If the material has dried, a suitable cleaning solvent may be used.